I totally love the background stamp - gorgeous card! I absolutely love this. The layers are beautiful, the color is just perfect for the season and that font is way cool! Truly unique and beautiful, love this card, just stunning! Everytime I see a digi card from you, I need to blink and say to myself "there was a HA kit like that?!" you dream up such cool designs, Lucy! 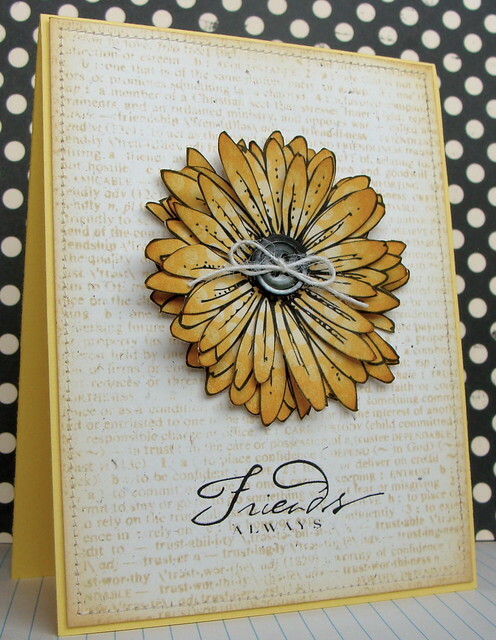 Love the colors you used for the card and it can be used for any occasion. That is a great sentiment stamp and I really like the dictionary stamp too. Thanks for sharing. OH, this is just gorgeous!!!! oh, this makes me smile ear to ear. so happy! I'm loving your trio challenge! This is such a HAPPY card! So pretty, Lucy! Love your soft background and the lovely flower! This is just FANTASTIC Lucy (as is everything you make imho!) You amaze me! Wow! This is so beautiful. Love all the elements in this card!!! Just beautiful Lucy - adore it. Wow, this is very pretty !! love it ! soooooooooooo gorgy! I LOVE THIS ONE! one day I have to do the digi thing...just a chicken..but I love your cards! Such a pretty card, Lucy! Love the soft yellow shades! I'm starting to look at patterned paper in a new way! Adding the distress ink makes it look so different. Thank you for sharing your card and talent with us. I love how you layered it 3 times. Beautiful! This is beautiful! Love the colors and the background is perfect! How beautiful, Lucy. The layered flower is amazing and I love the soft yellow shades. Lovely - love the colors!!!!!!!!!!!!!!! gorgeous card.